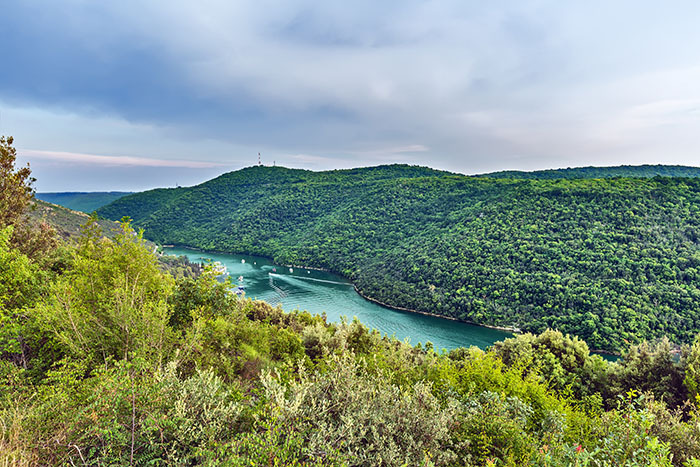 If you’re looking for something exhilarating, memorable and exciting to do in Istria, then look no further than the Limski Kanal. This stunning natural marvel is a sliver of sea that stretches for ten kilometres to the heart of the Istrian peninsula, hailed as the most dramatic geological sight in the region. This unique inlet was formed when, during the Ice Age, the coastline of Istria sank, causing the sea to fill the Draga Valley. Cliffs, made predominantly from limestone, dramatically border this narrow stretch of water, rising to 150-metres high in certain parts. These lofty cliff faces are carpeted in flourishing green foliage, which contrasts vividly with the cobalt water below and the often equally as azure sky above. The cliffs that hug the Limski Kanal have long been a popular place for rock climbers. There are five sections for climbing on the northern side of the gorge, which begin close to the boundary of the Lim Valley. The majority of the climbing sections face south, making it a great choice on fresher but sunny days, when some warmth of the sun is welcomed. For those wanting adventure without having to climb the cliffs, a visit to Ramuald Cave promises to be an exciting and memorable day out. This 105m long cave is situated on the eastern edge of the south bank of the gorge. Its name derived from a belief that St Romuald of Ravenna lived in the cave as a hermit from 1002 to 1004. On the western side of the cave there is evidence of fascinating Stone Age rock art. Naturally, climbing sheer cliff faces and exploring caves is hungry work and following an exhilarating exploration of the Limski Kanal, visitors can enjoy a delicious meal in a waterside restaurant. The deep-green waters of this beautiful fjord are a haven for fishing, particularly mussel and oyster farming. Fresh seafood is therefore served in abundance in the restaurants in the area. One restaurant that’s renowned for its deliciously fresh fish, scallops, mussels and other seafood, is Viking. Diners at this popular restaurant on the banks of the water can enjoy tucking into mouth-watering seafood and other dishes on a terrace that overlooks the fjord.